Workers at Ford's Oakville assembly plant voted on the contract earlier today. About 2,200 of the plant's 5,000 workers are new hires. Unifor went into negotiations with the Detroit Three seeking significant investments in their Canadian operations, hoping to put an end to nearly two decades of job losses in the auto sector. It was able to do just that, as the union secured $1.6 billion in investments in many of the key plants Unifor identified as being at risk of closure. Unifor’s round of bargaining this year with the Detroit 3 came to an end on Sunday when Ford Motor Co. workers approved by 58 per cent a tentative deal with the automaker. The Ford deal includes more than $713 million in investment commitments to the company’s Canadian plants, mostly for its Windsor, Ontario, engine operations. In a Sunday statement, Unifor President Jerry Dias called the labour negotiations a success for Unifor members. “Our success in these negotiations should be a reminder to all employers and the government about the kind of jobs and economy that Unifor is fighting for," Dias said in a statement. The union’s new contracts put the Canadian auto industry in a better position now than it was earlier this year, said Kristin Dziczek, director of the Industry, labour and Economics Group at the Center for Automotive Research in Ann Arbor, Mich., in an interview ahead of Sunday’s ratification vote. However, Dziczek said more must be done to secure the long-term stability of many of the Canadian plants, including General Motors’ Oshawa, Ontario, assembly plant and Ford’s Windsor engine operations, among others. The Ford contract was ratified in large part thanks to overwhelming support from workers at Ford’s Windsor engine plants, which will receive about $613 million in investments for a major new engine program for some of the automaker’s top-selling vehicles. About 89 per cent of workers at Windsor voted in favor of the deal, compared with 45 per cent of workers at the Oakville, Ontario, assembly plant, according to results posted on Unifor Local 707's mobile app. "This competitive agreement with Unifor enables Ford of Canada to further strengthen its business and positions the Canadian operations for future success," Steve Majer, Ford of Canada vice president of human resources, said in a statement late Sunday. "Ford continues to speak with the federal and Ontario governments to ensure long-term sustainability for Canada's auto manufacturing sector." The Windsor operation will be the “sole global manufacturing source” for a large engine displacement program, according to a highlights packet distributed to employees. Ford is also expected to build an updated 4.8-liter V-8 engine for the F-150 pickup truck in Windsor, the union said. About $100 million will go toward mid-cycle refreshes of the Ford Edge and Lincoln MKT crossovers at the company’s Oakville, Ontario, assembly plant. The contract, like those with GM and FCA off which the Ford deal is based, includes a $6,000 bonus, three $2,000 lump sum payments and two two-per-cent wage increases for veteran workers. New hires remain on a 10-year wage grow-in period but will now receive pay increases each year under the deal, as a three-year wage freeze has been eliminated. The continuation of the 10-year wage grow-in period drew the ire of many members at Oakville, where about 2,200 of the plant’s 5,000 workers are new hires. 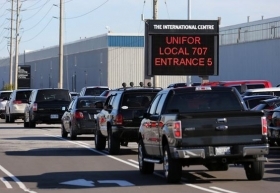 A divide between local union leadership in Oakville and Windsor over the pattern culminated last weekend, when Unifor Local 200 in Windsor criticized its Oakville counterparts for demanding a break from the pattern, a rare public display of disunity from Unifor leadership. The margin with which the Ford contract passed was lower than the margins for the GM and FCA contract. About 65 per cent of GM workers voted in favor of their contract, while 70 per cent of FCA workers did the same. Under the contract, new hires will be placed into a defined-contribution retirement plan, which passes much of the financial risk away from the employer and onto the employees. Workers will be required to contribute four per cent of their earnings to the plan, which Ford will match. The same applied to workers in the Ford and GM contracts. New hires will be placed on a defined-contribution retirement plan, seen as less risky to the employer than a traditional pension plan. The Ford deal would create or save 519 jobs over its course, according to the highlights packet. Any new jobs would first go to the 280 Unifor members currently laid off and on a recall list. Ford also agreed to hire “up to 75” skilled-trades apprentices between the Oakville and Windsor plants.